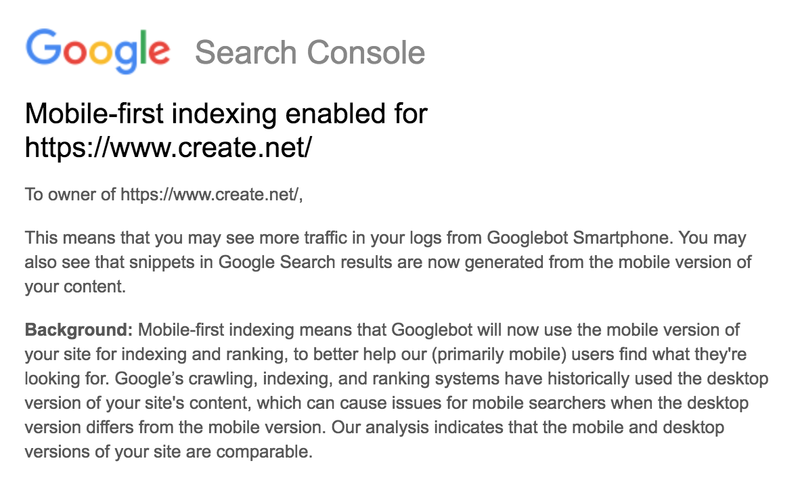 Blog > Google Launches Mobile First Indexing. Is Your Website Ready? Earlier this year Google announced that they were beginning to migrate websites that follow the best practices they have set for “mobile-first indexing”. This update is part of a major shift for the search engine and could shake up their search results over the coming months. In this blog post we’ll explain the change and what you need to do ensure your website is ready. Why Is Mobile First Indexing Important? 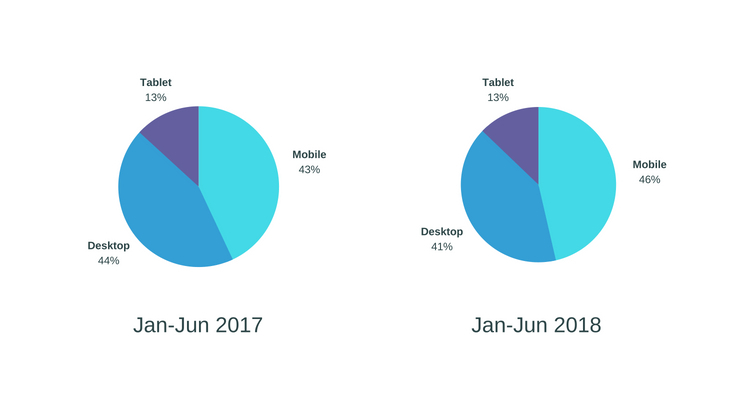 Back in 2015 Google announced that searches on mobile devices had overtaken those on desktop and that they were moving towards a mobile first experience. Around this time Google began boosting mobile friendly websites, so they would appear higher in the search rankings than sites which weren’t, and since then have continued to gradually improve their mobile experience. This latest step to migrate the way they view websites enables them to meet the needs of their growing primary audience - mobile users. This growing audience is mirrored in the visitor usage we see on the websites we host. The first half of 2018 has seen the number of visitors on mobiles continue to increase to 46.39%, while the number of visitors on tablets and desktops has decreased to 12.84% and 40.77% respectively. Perhaps this is due to a shift in people who were using tablets, now feeling increasingly comfortable doing more on their mobile phones? Social media apps like Facebook and an increase in advertising on these platforms is likely to be pushing website visits from mobile up too. 88% of visitors from Facebook (to websites we host) are viewing a site on a mobile or tablet. It’s therefore not surprising that Google are gradually shifting their focus. Google are informing website owners by email as their sites are migrated to “mobile first indexing”, and if you have a Google Search Console account and a mobile friendly website you may have already received this email, if you haven’t yet it’s definitely one to look out for. Getting this email means that Google is using the mobile version to determine what your website is about and how it should rank in the search results. All the email notices we’ve seen have been the same and indicate that the websites Google is choosing to migrate have very similar desktop and mobile content. Perhaps this is Google’s way of limiting the impact this change may have on your websites ranking while they are rolling out this change? Whether this is the case or not is difficult to know but once you’ve received the email, we recommend keeping an eye on your main search result positions as this change might affect your search ranking. 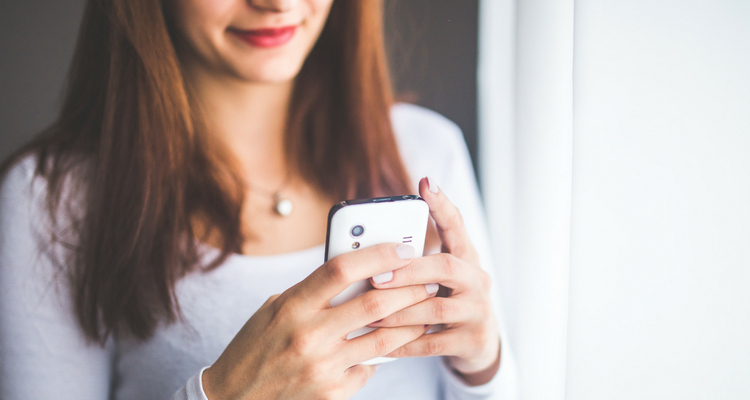 How Do You Benefit From Mobile First Indexing? If you’re not sure if your website is mobile friendly, a good way to check is to enter your website domain name into Google’s Mobile Friendly tester. This will tell you if it is or not very quickly. We’ve been building mobile first, responsive website templates since the start of 2014, so if you’ve built your website with us since the it’s highly likely you’ll already be optimised for a mobile experience. If it isn’t mobile friendly, you simply need to change to a responsive website template (it really is that easy). Our system will do the rest. We do recommend building your website pages with our latest content making tools to create the best mobile experience and code behind the scenes, but this isn’t necessary to achieve a mobile friendly website (you can make these changes gradually, or as and when you have time). To move your website to mobile start by viewing our latest templates and reading our guide on how to change a website template. Then log in into your Create account and try them out on your website in the Design area. You can always change template again later if you want to try another! If you’re not sure which to choose, get in touch with your Account Manager who will be happy to advise you based on your preferences. If you don’t have time to do this yourself, we offer a site conversion service and can make the necessary changes for you. Drop us an email for more information. Registering your website with Google Search Console (Previously Google Webmaster Tools) enables them to communicate with you about your website. You’ll also be able see lots of super stuff like whether your website is being indexed successfully in their search results, and what search queries people are using to access your website! Again, it’s quick and easy to do so if you’re not registered with Google Search Console, read our guide on getting your site set up. From looking at the websites we host, we can see that people using mobiles view less pages, and spend less time overall on a website, than those visiting on desktop and tablet - around 25 seconds less (which is quite a lot of time on a website). When the website is mobile friendly the amount of pages viewed and time spent on the site can increase by as much as 10%. There's a fair bit of evidence to suggest that over the last five years people have been using mobiles for different purposes to their desktop counterparts, as a generalisation, to find quick information whilst on the move. As mobiles have overtaken desktop (and in some instances become the only or primary device for accessing the internet) this purpose continues to change and will become more consistent with desktop usage over time. It's therefore no longer enough to simply have a mobile version of your website - you should think carefully about what's on it too! If you sell through your website the statistics are clear - mobile is a massive opportunity. For the first half of 2018 the number of purchases and the total revenue of sales (through websites we host) has increased again, with 41.08% of all revenue, and 53.99% of transactions occurring on mobile devices. Even if you think YOUR customers aren't using their mobiles to view or buy from your website, they probably are and your potential audience definitely is. So, what to do? Before you even look at your website, get back to basics, what is the purpose of your website - do you want the visitor to make a purchase, complete an enquiry form, or find out a particular piece of information - like your opening hours? Does the purpose vary depending on the type of visitor and the devices they use? Make a list of the objectives of your website and prioritise them. Determine what the most important things you want a visitor to do are. Using these objectives, spend time looking at your website on a mobile. Try to look at it fresh as you'll know your website and how to do these things. Ask family and friends to complete these same objectives on their mobiles and watch while they do it. Where do they get stuck? How quickly can they complete the actions? Make changes to your website and try again until it’s obvious. Ask yourself, is it clear what my website is about and what action I want someone to take? Is it fast? Can people navigate quickly to what they need? Remove things you don’t need and spend time cleaning up the content - is it displayed in the right order or should you move it around? Spend time looking at Google Analytics to see which pages get the most mobile visitors - it’s likely your homepage is the most visited page of your website, use Analytics to understand this and then prioritise updating these pages first. Google Analytics is now linked to Google Search Console so if you’re setting up that in the point above, it’s easy to do this too at the same time. You’ll gain access to information about your website visitors, what they look at, where they come from, what devices they use, and much more. As you make changes to your website Google Analytics can provide you with insights into the improvements you are making. Are visitors staying longer, are you improving your goal conversion rates, have your visitors increased? It's definitely worth installing it and benchmarking where your website is right now. Here’s how to setup Google Analytics with your Create website. These tips only begin to scratch the surface of mobile optimisation, so as always, if you need specific advice on your website please do get in touch with your Account Manager who can advise you. We’ll be following up with a series of blog posts outlining more detailed tips and examples so you can make the best content for your visitors. We’ll also be looking out for further information from Google and keeping you updated as they roll out these changes. Has your website been moved to “mobile-first indexing” by Google? Did you notice a change in your visitors, search engine ranking or visitor numbers? I’d love to hear about your experiences in the comments below. What does Google+ closing down mean for you?